For 3 consecutive years Northern Lights Cedar Hot Tubs has been awarded #1 l Sauna Manufacture in North America! Once again Northern Light Cedar Barrel Saunas receives the Best of Class Award for 2015 for the category of Saunas. 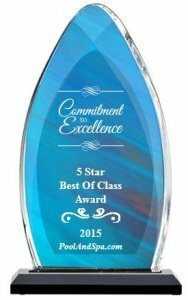 This award is based on quality of product and overall customer satisfaction.